No reviews or explanations regarding the choices of books, but still, a few notes are due—e.g., why I supply only a list and not the snaps of the covers. 1. Many of my books still remain packed up in the movers-and-packers’ boxes. These boxes are kept tightly sticking to each other and right in front of the wall-cupboard that is full of even more books (stacked up several layers deep). Since there is no place elsewhere in the house, the boxes stay there—they cannot be opened because if they are, I don’t have the space to keep those books at some other place. Further, since the boxes are heavy, I cannot easily move them aside and reach into the cupboard either. In short, these days, most of my books happen to be physically inaccessible to me. (The apartment where we currently live is too small for us.) Unless there is a strong reason for reference, the books don’t get out; they just stay where they are. Further, I don’t have paper copies for all the books that struck me when I took up this challenge, because a couple of them I only read in the university library (i.e. the Hill library of UAB), or later on, as PDF documents (not paper copies). For all such reasons, instead of posting the covers, here, I will supply only the titles. 2. There were other books that had struck me even more preferentially, but I decided not to include them in this list here because they were in Marathi. Drop me a line if you wish to know which ones those were. 3. All in all, I spent roughly less than 2 minutes (possibly less than 1 minute) in getting to the following list. However, later on, I decided to re-arrange it in the chronological order in which I first ran into these books. The year of my first acquaintance with the book is given in the square brackets. Since the initial posting, there is a change in one of the books. Now I list the 20 cases book by Ian Stevenson instead of his 4 volumes, because I now remember that the former was what I had completely read through; the latter I had only browsed through. … Hey, others get an entire day per book, OK? 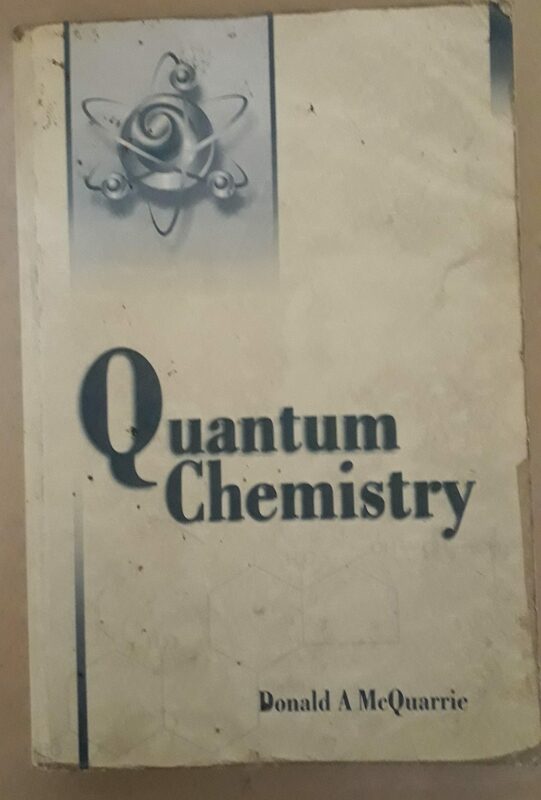 On second thoughts, I wanted to have Quantum Chemistry by Donald McQuarrie [17 February 2011] in there. … So I have removed a CS book which used to appear on the list (viz., Structured Computer Organization, by Andrew Tanenbaum ). In fact, since McQuarrie’s book is easily accessible to me right now, I am right away posting its cover here; see below. I guess the songs section is not really necessary for this post. So I will drop it for this time round. First, I refer you to my last blog post about QM, namely, “The mysterious quantum mystery” [^]. In contrast, in this post, I am going to briefly mention a certain development concerning the presentation of quantum mechanics which is only too welcome. … IMO, it is a wonderful development, and one that is truly worthy of respect. OK, let me not stretch your patience any further. I am talking about a new book on QM—at least one that was new to me until a few days after my last post on QM (i.e. until about 28th/29th of July). Longair, M. S. (2013) “Quantum Concepts in Physics: An Alternative Approach to the Understanding of Quantum Mechanics,” Cambridge: Cambridge University Press. The best way in which, IMO, I might introduce this book to you is to say that this is the book that I both did not expect to find, and yet, curiously, was always looking for, for many, many years—certainly, for more than two decades. The second-best way to introduce this book to you, is to say: (i) that this book is written in the style of a typical university text-book on a topic other than quantum mechanics, topic like, say, fluid mechanics or heat transfer; (ii) that it is (or at least should be) understandable to an undergraduate (or at least the beginning post-graduate) student of physics (if not also of engineering/technology/applied sciences); and, most importantly, (iii) that it presents quantum mechanics in the historical order of development. The third-best way to introduce the book to you is to ask you to go and notice the official blurb at the publisher’s site [^]. A bad way to introduce the book to you is to ask you to go and read a very expected kind of a customer reaction (but a well-meaning one) which the book has already generated at Amazon—I mean the closing sentence in this review [^]. Don’t believe it. Instead, do what I did. Buy the book. Immediately. I have not yet read even 10% of this book. But, I, as usual, have randomly browsed all through the text. … It’s a great book. I will certainly have occasion to write more about it some time in future—by way of both: a review, and some occasional reference in connection with my own thoughts. And, for those of you who do buy books on QM but still are not yet sure if you should really buy this one or not: Note the Wiki page on the author. In short: the author is an FRS guy who (very recently) retired as the Director of Development at the Cavendish Laboratory (i.e. the physics department of the University of Cambridge) [^]. Yes, as the title clearly tells you, my superposition state [^] has collapsed to |having a job (as a Professor)>. In fact, it did, right on July 1st, 2013. I have joined the Yadavrao Tasgaonkar Institute of Engineering & Technology, Karjat, as a Professor in the Department of Mechanical Engineering. (I) I was too busy moving my stuff from Pune to Karjat. My own stuff, that way, is sparse even by a graduate student’s standards, let alone that of a professor’s: 1 plastic chair, 3 plastic tables, 2 laptops, 1 printer, 1 suitcase, 1 shoulder-bag, and books, is pretty much describes it all. At least as of today. The difference is (and will remain): the books. I carry the vice of buying books. The last part surely makes it a vice, no? I mean, no “ghassoing” solving problems or finishing books? A book, to me, is not like a bottle of wine to be savoured over a week-end. A week-end is a negligibly small period of time, in fact, a vanishingly small one to me. A book is rather like a hypothetical (Marathi word) “loNche” [nearest English equivalent: pickle] to me. Unlike the real “loNche,” which pretty much gets finished or at least has to be replaced every year, a single book for me can easily take more than a decade to finish, and sometimes it can even never come to pass. The size of a book has nothing to do with it. It has more to do with my enjoyment of it, at my own pace: taking a byte here, and stopping to think/wonder about it, and then, taking another byte there, and enjoying it. … To indicate how strong this vice is, allow me to state: I still have to finish Feynman’s tiny book for the layman on QED. (I bought it in 1999. I went through the first chapter in 1999, and the second chapter in early naughties. I think I forced myself through the third chapter in the late naughties but without completing it. The matter rests on the “as is” basis there.) Any guesses if I have finished reading, at least once, his three volumes? But all the above does not mean that I am not a book-worm. My “a dip now, and a dip then” approach also translates into “a dip here, and a dip there.” I am highly, say, amorous(?) when it comes to books. (My (actually) preferred way of thinking about it is that I am a parallel processor. (And I don’t say this because I am now a professor. It’s a fact that that’s the way I think about it.))) I may take in only a small portion from one book at a time, but I am almost always taking in way too many of them from different books, at the same time. No, this is not a habit that the Internet or Google seduced me into. I was already into it. I guess I have perhaps never finished a book from the start to the end in one sitting, or even over one single week-end or within a single week. Not since when I was in school. Articles, essays? yes. Even long essays? yes. But books? nope. Since I left the school, I have never read a book in a consecutive sequence of readings. Neither have I read any book in the same sequence as that of its printed pages. I just have to have an advance peek at some random page which comes later in the book, just to see what’s happening there, even if only for ten–twenty seconds, and then immediately return back to where I am. Or, to flip back to some random page earlier (or back to the Table of Contents) and check out where I am in relation to that. The second might be understandable to many, but the first may not be. So, nope, I haven’t been much of a “customer” for those library members who take secret pleasure in scrawling spoilers on the first page of a detective novel. In fact, except for my early time when I was in high-school, for most of the later time, I myself haven’t hesitated looking at the last few pages of even a detective novel, just to get a clue of how this whole thing is going to end. … Yes, I knew Howard Roark was going to laugh in the end, and John Galt was going to trace the sign of the dollar in space, whatever that meant. So, most my books are non-fiction. A majority of them are on engineering, a very significant minority on physics. I used to have more than 500 books, many of which I simply dumped by weight to the second-hand book sellers, in one of my past reorgs at home (esp. before going abroad). I still have hundreds of books. So, moving books was a major task. Another thing. I didn’t engage a tempo or a small truck for moving my stuff. It was plain that for some reason or the other related to relocation (including official things, rent agreement, etc. ), I would have to travel to Karjat quite a few times. So, I decided to move all my stuff in my own (old) car. (II) I think I have a fairly good idea of what kind of things to expect where in India, particularly, in Maharashtra. I knew that one of the most significant problems I would face once in Karjat would be: a very severe reduction in the bandwidth of my Internet connectivity. My ISP (Idea 3G) has proved me wrong. The bandwidth has not asymptotically approached zero; it has been zero for most of the time. Well, at least it was so until the time that I repeated my threat to close down my account some three times within four days. May be because I am a “Preferred” or a “Platinum” or a “Golden” or whatever type of customer to my ISP [they sent me a personalized desk calender in January 2013, but since I didn’t have a job, it was simply lying catching dust thus far], they apparently took my threat somewhat seriously after the third time. So, for the past few days, I have been getting about 0.1 to 0.5 Gbps instead of the 3 Gbps, and that too only in spurts, and that too, only for about 25% of the times that I try connecting to the Internet from my home, in the early mornings or late evenings. I have a 3G card, which is supposed to give you a seamless connectivity all over the country (including at places like Kedarnath, esp. if it would be used by a (Hindi word) “poti” i.e. grand-daughter). However, just 90 km away from Mumbai, but in a rural area, even if I sometimes do get some connection at home (and even if it’s only in infrequent spurts of 0.1 to 0.5 Gbps each), once I am in my Institute, which is located just a few kilometers away, no service is at all available. Yes, I tried stepping out of the cement-concrete buildings and hallways, and thus into an open space. No luck. The 3G card doesn’t even get “registered;” the card sending a request to allocate an IP address is simply out of the question. My college WIFI account is yet to be set up. So, I have been without the ‘net for most times. For both these reasons—relocation and bad connectivity—I have not been able to blog as much. Anyway, our UG term begins next Monday, and the PG term, some time later. While the Time-Table for this term has not been finalized, by informal exchange at our college, the impression I get is that I would be expected to take one or two courses for the PG class (ME in Machine Design), most probably, these: (a very introductory sort of a course on) Advanced Stress Analysis, and either FEM or CFD (both of which are electives in University of Mumbai), and/or, an FEM Lab course (which is core/compulsory). I would appreciate it if someone could help me in locating this song.